I have been so blessed with the amazing talents that have helped me bring this dream to fruition. One of the most notable performers who have lent their talents to this project is Aretha Scruggs. The number of major artists she has performed with is dumbfounding. Her most recent outing (that I know of) was her work on Katy Perry’s latest album. Please visit my website, wesgraham.com to hear samples of her work. and don’t forget to join my mailing list. I’ve included Aretha’s bio (from her website) below to give you just a little idea of how amazing she is. Aretha Scruggs is a singer-songwriter/actress, who has been using her gift of song all over the United States, and now abroad since the age of 4 years old. Having her start in a singing group called the Scruggs Sisters, which contained her three sisters and her parents on accompanying musical instruments, they over time, have sung at various churches, sporting and community events. Opening for such artists as The Clark Sisters, Commissioned, Yolanda Adams and Vickie Winans to name a few, they even got the chance to sing for such historical events as Rosa Park’s 80th Birthday party and the Tuskegee Airmen’s Congressional banquet. After graduating from UCLA in 2003, God opened the door for her and her twin sister Alayna, to be touring background singers for Natalie Cole and later other such notables as Christina Aguilera and Anita Baker. Through various TV and live show tapings, she has also backed up artists such as Whitney Houston, Patti Labelle, Jennifer Hudson, India Arie, Justin Timberlake, Pharrell, Tyrese Gibson and gospel greats Donnie Mclurklin, Fred Hammond, Yolanda Adams, Kirk Franklin, Israel Houghton, Tye Tribbett, Marvin Sapp and Mary Mary. She has been blessed now, to travel all over the United States, and to over 14 countries with her gift of song, and counts it a privilege to now speak and sing in both Portuguese and Spanish. Currently, she can be seen performing live vocals with a jazz quartet called J.Mike & Friends. Combining jazz, gospel, latin, and pop stylings, they are making their name in the industry to bring live music to the masses. In addition, as a certified vocal coach for the past 10 years, she teaches both individual and group vocal lessons. Since graduating with her Master’s Degree from Fuller Theological Seminary in Cross Cultural Studies with an emphasis in Ethnomusicology & Global Worship, she has made annual trips to Sao Paulo, Brazil, to host vocal workshops, serve the people of Brazil through philanthropic projects, perform in various churches and jazz clubs and continue learning Portuguese. 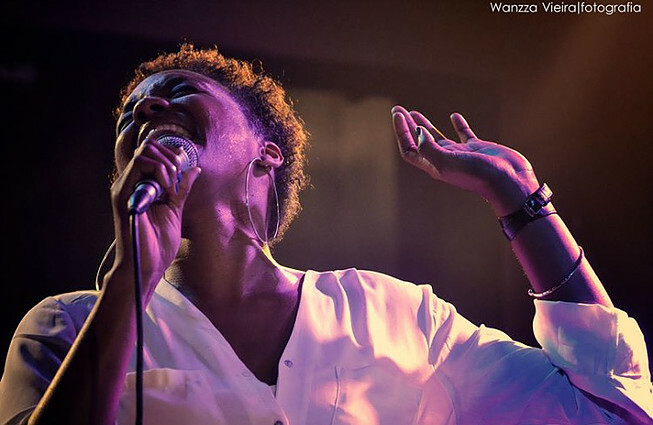 Her goal is to create a bridge between Brazil and the US and host other musicians and singers through a cultural exchange program. In all, Aretha is honored to share her gifts with the world for the glory of God.